My Digital Thoughts : Shashi's Diary: The Road Warriors line at Airport Security - TSA has a blog .Wow! The Road Warriors line at Airport Security - TSA has a blog .Wow! I am thrilled to see that TSA has a blog - I think that's a great step. When I visited Chicago a few weeks ago for SOBCon08 I saw that Midway airport has a new queue system in place. The line moved fast and the expert line was full of people who looked like they take day trips. I think this is a great step and TSA is doing the right thing. 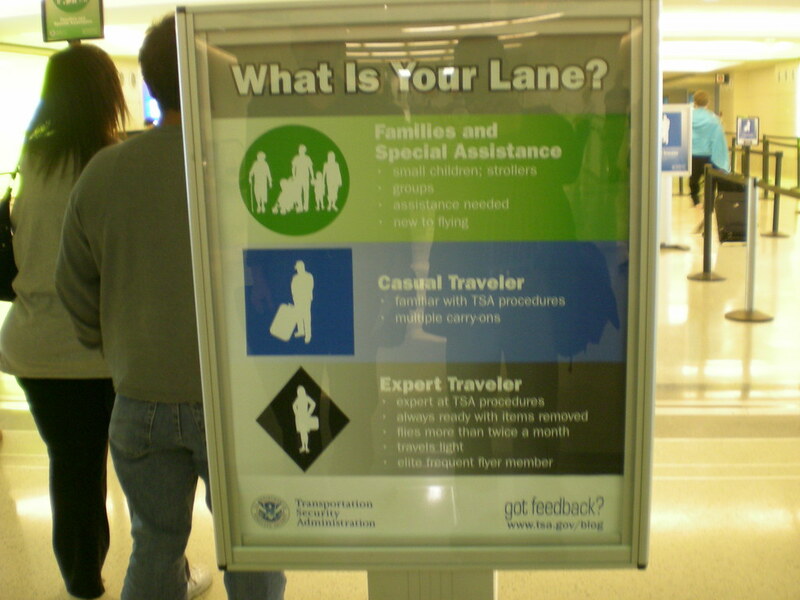 "Black/Blue/Green, First Class, Premier, Red Carpet-it seems like there are 18 different types of lines leading to a TSA checkpoint and only one for the "regular" traveler. What's the deal?" "we wanted to build a new environment that would make our behavioral observation programs more effective by helping to reduce the overall stress in the queue and the checkpoint. Second, we wanted to find a way to increase our efficiency and reduce x-ray alarm rates by allowing the fast passengers to move fast, and the slow passengers to take their time. End result - the "Black Diamond" pilot in Salt Lake City that joined the queue to the checkpoint and allowed passengers to pick a security line designed to meet their needs and let them move at their own pace (keeping Road-Warriors and the Families separate for the whole screening experience). For those new to the blog, "Black Diamond" was named after the ski logos that help snow skiers choose ski trails based on their level of difficulty. The results were tremendously positive-especially with passengers who wanted an experience where they could take their time going through security. The queue and the security experience were much calmer for passengers, and our initial results show that the new multi-queue "Black Diamond" checkpoints are more efficient than regular checkpoints. We're now 20 airports later, and we're still seeing the same results. As a matter of fact, peak wait times at Salt Lake City this past Memorial Day weekend were about half as along as they were last year, even though the number of passengers going through the checkpoint actually went up by about 5 percent. Check out their blog at http://www.tsa.gov/blog. The writing is conversational and they also have this cartoon about themselves on the blog. At Network Solutions we have also expanded the scope of our blog SolutionsArePower.com to talk about events and news where we can provide some views so take a look and give me your comments.